EBC revival services this Sunday at 11 am & 6pm!!! God has been working in our church family and preparing us for our revival services coming up this Sunday! Are you ready? Our revival services will be on Sunday, March 23 at 11am and 6pm, and Monday and Tuesday, March 24-25 at 7pm. Our guest speaker will be Evangelist James Croft! Have you been preparing for revival? When we experience revival we will be spiritually revitalized. We will come alive with a greater desire for God. We will be more concerned with pleasing God and being led by the Spirit of God and the Word of God than anything else! Revival is possible, but it starts with you and it starts with me! Revival is not a service and is not for our community and our country it’s for us right here at EBC! How can I prepare for revival in my heart and life? 2 Chronicles 7:14 says, If my people, which are called by my name, shall humble themselves, and pray, and seek my face, and turn from their wicked ways; then will I hear from heaven, and will forgive their sin, and will heal their land. We need to be spiritually revitalized. We need to awake out of spiritual sleep, with a greater desire for God, and a greater devotion to God! I encourage you to get alone with God this week and pray—do some examination and some deep confessing and repenting of sin. Welcome God to investigate your heart like David did and be ready to respond! How will you prepare to experience revival? Let me know by leaving your comment. I would love to hear from you. On Sunday, March 3rd, at 6:00 p.m. Emmanuel Baptist Church gathered for Vision Night! It was awesome! Vision night is one of the most important gatherings of the entire year. And oh what an inspiring Vision Night gathering we had. So what really happened on Vision Night? What was said from God’s Word? How were we the people of EBC challenged to help see our vision become a reality? I am glad you asked! Here is what happened! God blessed us with an inspiring vision night gathering on March 3rd! The atmosphere was great, the crowd was attentive and response, and the vision was compelling and on point. On this special night I shared our Vision for this year: Growing together: Upward, Inward, and Outward! Our vision theme verse is found in 2 Peter 3:18, But grow in grace, and in the knowledge of our Lord and Saviour Jesus Christ. To him be glory both now and for ever. Amen. During our gathering I explained how our vision came from God, what the vision is, and I also painted a picture of what our vision looks like in action. I challenged us all by asking some key questions like, “What is it going to take for us to grow together? What will it take for you and me to step out of our comfort zones and really get engaged in the mission?” To help us get engaged I reminded us of what our God-given purpose, mission, and vision really are! The purpose of our church—the reason why we exist at all is to Glorify God—to seek to exalt Jesus our Savior and please Him in how we live and in what we do. The mission of our church—what we are to be doing—is to make disciples of Jesus Christ! Our mission is to help people become growing healthy disciples of Christ in our church, community, and beyond. As a church we are to know Jesus more and make Him known to others. How can we become a church that glorifies and pleases God in who we are and in all we do? How can we together become growing healthy disciples and become a disciple making factory? That’s where our vision comes in! We will become the church God wants us to become by Growing Together! On vision night I then shared this important truth: growing upward, inward, and outward are all connected to each other! We won’t grow upward in our relationship with God unless we open up to God and desire to know Him more. And we won’t grow inward, building real relationships with other church members and attenders and guests unless we first grow upward. And we won’t grow outward, reaching new families with the Gospel of Jesus Christ, unless we first grow upward with God and then inward with others within the church body. They are all connected! At the end of our gathering I shared some action steps. In order to change the outcome—our future—we must change our behavior. That’s what we do. And in order to change what we do we have got to change who we are. And that means experience a change of heart! We have to get God’s help with that! Let’s decide together to take some action steps toward our vision so we can see our vision become a reality! What steps are we to take together? God truly worked in a great way! We all have steps to take so we can see our vision of Growing Together: Upward, Inward, and Outward become a reality at EBC! If you were present at the vision night gathering or have received your copy of our growing together goals, or just love growing in Christ let me know how God has worked in your life and let’s get growing! What area(s) has God showed you to grow in so we can all grow together? Keep the conversation and vision alive by leaving your comment. We had a great baptism service! On August 26 we had the privilege of baptizing 8 folks! Praise the Lord for their testimony for the Lord Jesus Christ! We had great Missions Sundays! God really blessed our services on October 7 and 14! Guest speakers Ed Gibson and Ralph Done challenged us to give grace for grace! With all of the grace we have received from Jesus we ought to give grace to others, specifically our missionaries through our faith promise missions offerings. Thank you for your faithful giving! Be sure to thank our veterans for their service to our country! Come out and have a blast at our fall festival on Saturday, November 17 at 5:00 pm. It will be held at the Wilkerson home (14705 Jesse Yarbrough Rd, Glen). Just bring your favorite soup or chili to share, and your favorite game to sponsor and play. You can set up your game and have a booth just like a festival. Just ask Miss BJ Wilkerson for ideas. There will also be a hayride for the kids. Sign up at the back table at the church for this fun time! We will be having a Thanksgiving praise service on Sunday, November 18 at 6 p.m. Following the service we will also have a pie fellowship. Come out and be a part as we praise our great God and enjoy some great pie! Please sign up at the back table at the church. There will be no midweek service on Wednesday, November 21. The ladies of EBC are invited to a special Christmas brunch on Saturday, December 1 at 9:00 .am. There will be a Christmas devotional, games, good food, and fellowship! Don’t miss it. Please sign up at the back table at the church. The Resistance teens will be having a Christmas caroling activity on Friday, December 7. This is a great time to show the love of Christ to others and have fun singing Christmas carols. Our EBC kids will be providing a Christmas program on December 16 during the evening service! Be sure to come out and invite your family to join you for this special service. Following the evening service on December 16 the teens will be going to Heritage Park to enjoy the Christmas lights! Be sure to come out to our Christmas service on Sunday, December 23 at 11:00 a.m.! There will be Christmas music and a special Christmas message. This will be a great time to bring a friends or family member with you! We will have Sunday school at 10:00 a.m. and an evening service at 6:00 p.m. There will be no midweek service on Wednesday, December 26. Join us for our Christmas family night on Sunday, December 23. We will sing carols, have a short devotional, and a cocoa and cookie fellowship after the service. Be sure to come! What activity are you excited about the most? Start the conversation by leaving your comment! Vision…what are you still seeing? Earlier this year in February we had an important church meeting. It was a typical business meeting. It was fine. There were no issues or problems. No one made a protest or charged the pulpit. One thing that did happen is that our vision for the future was clearly shared. I reminded us that our vision is to see EBC become a church of ministry teams—one team per ministry. It’s the same vision I have been casting, sharing, teaching, and preaching since February 2010. I define a ministry team as a group of believers in Jesus who are like-minded, unified in purpose, mission, and vision and are advancing! As I reminded us of the vision I challenged each one of us to examine our own lives and walks with God and be willing to take the next step to help our vision be realized. Have you taken your next step? Vision is an essential element of a person’s life, family, and it’s especially vital in a local church! Vision is a seeing word. Author Aubrey Malphur’s defines vision as: the clear and challenging picture of the future of our church as it can and must be. Vision is possible and vision is also urgent—it must be! In order for our church to not just survive but thrive in Christ we must have a vision. Proverbs says that without vision the people perish. I believe the opposite is also true: a church—group of believers in Christ WITH a vision can flourish! A church with a great commission Christ centered vision will flourish and become all that God wants them to be and do all that God wants them to do in their community and beyond! When we as an individual member-we who make up the church-get on board our vision becomes real! Where does a vision come from? Vision is the picture of the future of what our church will become! The pastor and people who are serious about knowing and fulfilling God’s will for them in their community and beyond is ready to receive a God sized vision! After much prayer and worship and even some fasting God revealed to me the vision. Now a vision is not just something exciting and needful for the church to accomplish. Vision is specific! God will show us specific things, whether they are goals or objectives that must be done so our church can accomplish its mission best. Now let me say that our mission is the same as what all Bible believing Christ following churches should be pursuing: help people become growing healthy disciples of Christ and fully engaged members of the church body. My responsibility as the pastor is to lead our church in fulfilling our mission! As cool and needful as a vision is there is no way that I can fulfill the vision and mission of our church alone. That’s where each person at EBC comes in. Catch it! Communicate it! And help us fulfill it! On February 13th 2010 I casted the vision to our church! Our business meeting turned into a vision night service! God really worked, blessed, and I believed moved in our hearts. Since that day I have continued to cast that vision, reminding specifically our men, and then every member and attendee, leading them to pray and help fulfill and spread our vision. Have you prayed about your part in fulfilling the mission and vision of our church? How is our vision becoming a reality? Now these teams are still forming and developing. Each one still needs work and more team members! But God is putting them together! The good news is that God has just started building these ministry teams and you can join one! Since your arrival at EBC how has God used you to help us fulfill our mission and vision? Do you understand what our mission and vision is? 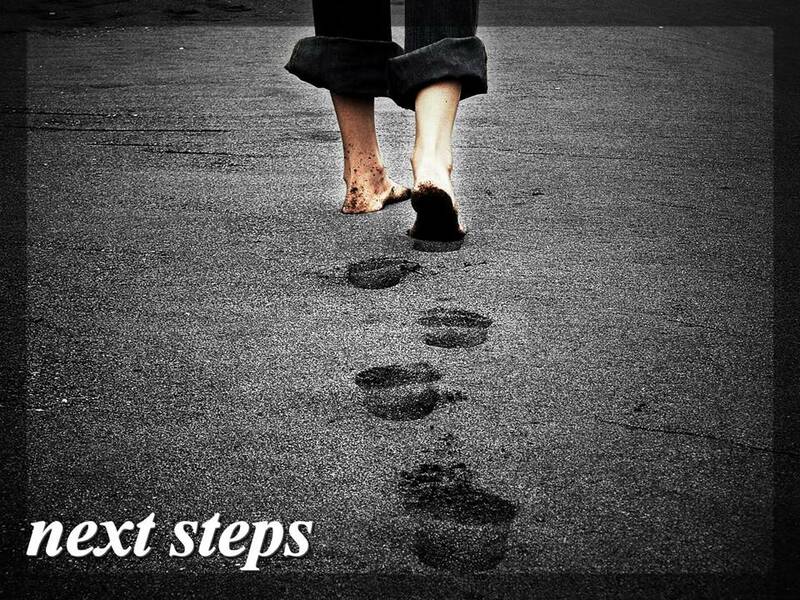 Will you take your next step towards being an active disciple of Christ and member of EBC? If you’re a member of another church how has God used you or your church to form ministry teams to fulfill the mission and vision of the church? Start the conversation by leaving your comments! Started a New Sunday morning sermon series from the Gospel of John! God gave Liberty and worked through the message from John 8, “Jesus is the One who forgives.” Thank God for that! Had a great Kids Team meeting Sunday night! Great group of ministry volunteers. We all are excited about having our summer VBS! Looking for Jesus to work through us and help us reach new kids and families with the Gospel. That’s just a week in the life of EBC. How is God working in your life here at EBC or at your home church? Join the conversation by leaving your comment! 2 Shots in the Arm we all need! Today we were pretty beat and tired. So my lovely wife decided to get us a Starbucks frap with an extra shot–of espresso. Oh yea, and a cake pop too! They were great. They gave us a needed boost. But as I worshipped today God led me to a couple of passages of Scripture that really gave me what I actually needed–a spiritual boost. Here they are. I hope they recharge your spiritual batteries too. The more we live the more God wants us to realize that we will find true contentment and completeness in Jesus—who He is to us, what He has done and does for us, and who we are in Him! Now those are some shots we really need for life and living! Did you need those shots? Start the conversation by leaving your comment! Our vision for EBC is to see our church become a church of ministry teams: one team per ministry! We can always function better, healthier, and accomplish more for Jesus when we all have the same mind and work together. EBC saw this happen in a great way this past Sunday! A quality Christ honoring worship service does not happen by mistake or by the efforts of one person. Our worship leader, fell sick suddenly on Saturday night. Our lead sound and media people, and their backups were unavailable. So I did what a good pastor does–I prayed! With the regular worship team out and their backups unavailable God helped me put together a team. I asked my wife Emily to run the media, Tim McKinnon to run the sound, and miss Hannah Wilkerson to play the piano and I led our worship. God really blessed. As we sought to worship Jesus in spirit and in truth everything came together well, Christ was glorified, and the church was edified! I thank the Lord for willing members of EBC who are willing to step out and up to serve with me. Thank you guys! Go Team! How has God used you at EBC or your home church to serve on a ministry team? How do you feel about being a part of something great? Start the conversation by leaving your comment! As we look to and “consider” Him, remembering all that He went through and all He has done for us He then empowers us, giving us strength to endure and not lose heart. That’s truth I needed today. I hope it empowers you too! PS Today no matter what you find yourself doing no matter where you are, you are going to experience victory–in Jesus! What’s your story? Has God renewed your focus? Does He need to? Join the conversation by leaving your comment! God is sure blessing EBC as the disciples of Christ gather to worship Him and accomplish His work. It has been a great fall so far! We are very excited that our very first website is officially up and running! It has been quite a project, but we are so glad that God has blessed our hard efforts and enabled us launch EBClife.org. We thank Steven Jordan, our EBC web manager; Nick Blevins, web designer; Dennis Schaffer, graphic designer; and the other members of our Web Team who helped with this project! Our new website is going to have a great impact on our church family and attract more guest families in the days ahead. As you begin using our website, you’ll not only be able to stay informed of church events and stay in tune with church life, you’ll be able to interact, engage, converse via Facebook, Twitter, and e-mail. You can also give online too! Check it out for yourself and let us know what you think. Here at EBC we are glad when God brings new families to worship with us. It’s even more exciting when the new families attend for a while and then decide to join, becoming part of our church family! The Hanks Family, Marty, Heather, Blaire, Hunter, Bailey, and Hannah, along with close friend Brittany Pearce made the decision to join our church family recently. We welcome them to our church family, and we look forward to serving the Lord together here at EBC! It is an exciting thing to see new guest families become active members of EBC. If you have questions about how to become a member, please talk with the pastor or another ministry leader. It’s also very exciting when God blesses our church families with children. Praise the Lord that the Bells had a healthy baby girl, Haidyn Victoria Bell. Congratulations, Edward and Victoria! The EBC ladies met on Saturday, November 5 for the fall fellowship! Led by Miss Emily Ramondetta, the ladies had some great food and connection. Their lesson focused on being thankful and praising our great Savior Jesus Christ! It is great to see our ladies connect and grow in their faith. On Saturday, November 12 our very own Dr. Charles Shoemaker was the main speaker at a seminar for pastors and Christian workers at the West Jacksonville Baptist Church in Jacksonville Florida. Dr. Shoemaker taught some great lessons. His practical teaching on ministry was helpful and a blessing! God sure has blessed EBC with some loving gifted workers in our Kids Zone ministry! More and more kids are coming and then coming back. They love it! They had a fun activity at a bowling alley in Jacksonville on Saturday, November 19. All the kids had a blast bowling. They finished their activity at Pizza Hut where they ate some yummy pizza and treats! We sure appreciate all of the workers who serve in the Kids Zone. God continues to add life to our Sunday morning worship service! One big reason is because of the uplifting, God honoring, encouraging music. Thanks Bro Jeff Davis for leading our music at EBC! We also thank Amy Davis, Bobbi Croft, Margie Croft, Kelly Alford, Bro Jimmy Combs, Pastor and Miss Emily Ramondetta for singing each Sunday on the praise team and providing other special music too. What a blessing. Keep it up! God has been recharging our church family on Wednesday nights from 7:00-8:15 p.m.! We were glad to have Rev. Bill Mosley, veteran missionary and active member of EBC, as our guest speaker during November Recharge. His practical Bible teaching about the Christian life was a great encouragement to our church family. We had a great Thanksgiving service this past Tuesday, November 22nd! People shared meaningful testimonies about how God had been working in their lives and how He had given them victory this year. The Bible lesson reminded us that we always have Someone to praise no matter what: our great God and Savior, Jesus Christ! The pie fellowship was great too. The pies were delicious and the time shared with church family was fun. This of course was just a warm up for Thanksgiving day. God has been strengthening families on Sunday mornings at EBC! Pastor Mike has been preaching a series of messages called “Extreme Spiritual Makeovers: Home Edition.” This is a sermon series designed to speak to every family, helping us grow healthy families that know God and experience His presence, healing, and blessing. This week’s sermon title is: “Developing Curb Appeal!” Be sure to come and bring a friend. Dr. Charles Shoemaker will be our guest speaker for December Recharge! He will be speaking on this timely subject: “An In-depth Study on the Christmas Story.” He will be answering some questions like, which Old Testament Prophecies speak of Christ’s birth? Why was Zacharias rebuked for questioning the Angel, but Mary was not? Who was the first recorded person to call Jesus, Savior? Don’t miss it! EBC’s Wednesday Recharge has relevant ministries for all ages including adults, the Resistance for students in grades 7-12, the Kids Zone for kids in K4-6th grade, and a nursery for children 0-3 years of age. We are having a special Christmas Eve candle light service on Saturday, December 24 at 6:00 p.m. There will be refreshments, singing, and a short Christmas devotional. Be sure to bring your friends and family. Christmas day falls on Sunday this year. We will have one combined service on Sunday morning at 10:30 a.m. There will be no Sunday school or Sunday evening service on Christmas. Let’s use this special day of worship as a way to invite our family, friends, and neighbors to worship with us and celebrate the birth of our great Savior and King. Get ready for the New Year with EBC on Saturday, December 31 at 6:00 p.m.! This special New Year’s Eve service starts with a New Year’s challenge from the pastor and a special time of prayer to dedicate our church family and the New Year ahead. There will be a New Year’s party to follow with food and games for those who wish to stay. New Year’s Day also falls on Sunday this year. We will have one combined service on Sunday morning at 10:30 a.m. There will be no Sunday school this day or Sunday evening service. Plan to join us as we worship God, focus on our exciting future, and pray for the New Year! As we gather together each service to worship God it is clear that He is providing the help, healing, and direction we need in our lives! He also is providing us with some opportunities to help more people know Jesus and make Him known. That’s why we are here. We thank God for who He is, what He has done, and what He will do in and through EBC in the days ahead! How’s your church life? Have you been blessed by the ministries at EBC or your local church? Start the conversation by leaving your comment! Emmanuel Baptist Church in Macclenny Florida? God blessed us with great preaching from Dr. Shoemaker! Africa, and one in Togo Africa! Awesome! We had great special music by our praise team! The conference was well attended! Prayerfully our missions conference goal will be reached as well: total participation! Our desire is to have every member and regular attender commit to give an offering to faith promise missions each week. I’m excited that our church has formed another ministry team! The Kids team is now official. Our church’s motto is “Together we can do it.” Our vision is to see our church become a church of ministry teams, doing the work of the ministry together one team per ministry. Why? So we can fulfill our mission best: All that is involved in helping more people know Jesus and make Him known. God has given our church a group of ladies that are gifted and who love God and kids! We are excited to see how God will use our unified efforts to reach more kids for Christ in the days ahead! We are planning an exciting kids activity and practicing for the Christmas musical! Thank you kids team for your efforts! We have a new exciting sermon series beginning Sunday 10/16! I am excited to start a new series called, “Extreme Spiritual Makeovers: Home edition.” This is a sermon series designed to speak to every family, helping us grow healthy families that know God and experience His presence, healing, and blessing! EBC’s Wednesday Recharge has relevant ministries for all ages to include adults, the Resistance student ministry, the Kids Zone, and a nursery. God has truly recharged our church family, helping us grow healthier in spirit and in number. We are also very excited to launch our very first website! Yes I know—pretty interesting having a blog, facebook page, and a twitter account but no website. Well it’s a long story and has been quite a project, but we are almost there! I really believe this new website is going to have a great impact on our church family and attract more guests in the days ahead. Our brand new website is going to help us interact, engage, converse, unite, and be informed all online! As more disciples gather at EBC to worship God and serve Him it is clear that God is working in great ways and our future is getting brighter and brighter! How’s your church life been lately? How’s your life been touched by the ministries at EBC or your local church? Start the conversation by leaving your comment!